How to ruin a guitar. How does this idiot say "I don't want to ship out of the USA?" Easy, $625.00 International Shipping cost. He had a clean black one for sale a while back. I cringe at the thought that he might have painted on top and relic'd it. I don't think it's an improvement either. The truss rod body notch does not look correct, and the back control plate looks wrong. The pickup looks too far away from the bridge, and at the wrong angle. I doubt the body is a Focus 1000 body. Even if it is a Focus 1000. Relicing one dosn't make it worth $3,000.00 more. Man these guy's are dumb. Does anyone buy from them? I have a legit real 85/86 Focus 1000. That has REAL WORLD WARE. That is a legit focus 1000. Very early, maybe overseas only. 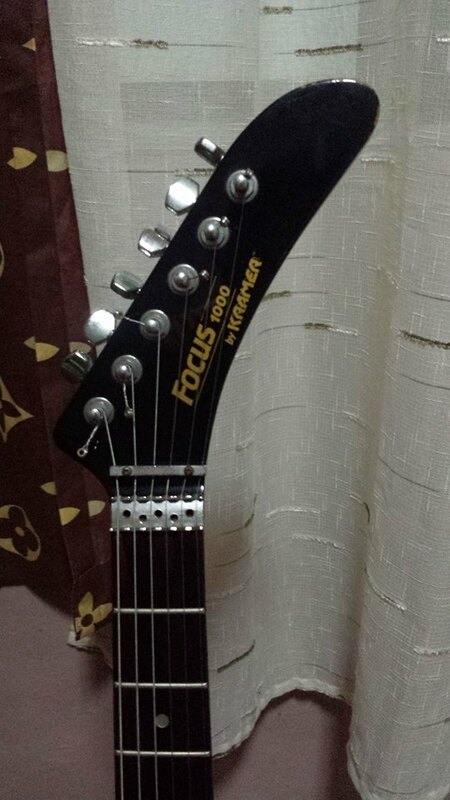 sixstring wrote: That is a legit focus 1000. Hell yea price is insane,but i wld kill for a lefty or righty 83 focus 1000 neck!!! They look so badass,i like them better then the american verisons which i think/thought are slightly diff?? If im wrong good ol sixstring will let me know,lol. Without a side-by-side look-see, the one major difference was the R5-R2 nuts. sixstring wrote: Without a side-by-side look-see, the one major difference was the R5-R2 nuts. To me they look slimmer all around like a 86 focus 1000 neck but with a non tilt and the back headstock to neck looks a bit different to me,i just really rerally dig that neck in all black with the white logo and rosewood board. the musikraft necks dont look close enough to me to,was gonna get one,but i just cant pay 600$ for one and it not look like the 83 1000 neck. This is the grail focus I'm referring to.